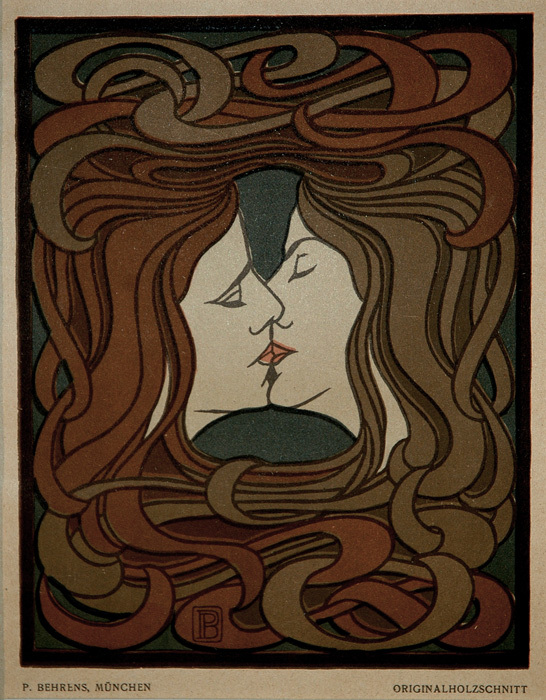 One of the most important exemplars of German Jugendstil, the German and Austrian equivalent of Art Nouveau, Behrens is perhaps best known for his universally-desired color woodcut, The Kiss, published in Pan, volume 4, n. 2 (1898), a work flaunted by every important museum in Europe and America lucky enough to have found an impression. Peter Behrens was born in Hamburg in 1869; he studied painting at the Karlsruhe School of Art, and then in Düsseldorf under Ferdinand Brütt. In 1890 he visited the Netherlands before settling in Munich. He was one of the founding members of the Munich Secession in 1893 and soon after the Freie Vereinigung Münchener Kunstler, along with Otto Eckmann, Max Slevogt, and Lovis Corinth. He also joined the circle associated with Pan, the leading periodical for fin-de-siecle German art. During the 1890s, he regularly exhibited his paintings and woodcuts during the 1890s, but at the end of the 1890s, he abandoned paintings for the graphic and applied arts, making designs for works in glass, porcelain, jewelry, and furniture. The success of these designs led to his appointment to the Kunstler-Kolonie in Darmstadt by Ernst-Ludwig, Grand Duke of Hesse Darmstadt, where he and Josef Maria Olbrich were the dominant artistic influences in the Darmstadt colony. Designing his own house led him to architecture and a progressive movement away from Jugendstil towards abstraction. In 1903, he was appointed director of the Kunstgewerbseschule in Düsseldorf, where he tried unsuccessfully to hire Kandinsky, Josef Hoffmanm, and H. P. Berlage in an attempt to bring in exponents of the latest developments in Germany, the Netherlands and Vienna, internationalizing ideas about the modern at the school. After the end of World War I, he again showed himself open to new developments and his designs show a more Expressionist interest, particularly in the cubic forms of the Neue Sachlichkeit. There is a considerable bibliography on his work as a designer and architect, conveniently available in Iain Boyd White's long article in the Grove Dictionary of Art, 3: 511-514, from which I have drawn extensively. Untitled / The Kiss. Original 6-color woodcut, c. 1898. According to Iain Boyd White, "The Kiss depicts a kissing couple, their faces framed and joined by voluptuous Jugendstil curves formed of their own tresses." One of the most acclaimed prints of the Jugendstil movement and a modern masterpiece. Image size: 272x215mm. Price: $3,500. Winterlandschaft / Winter landscape. 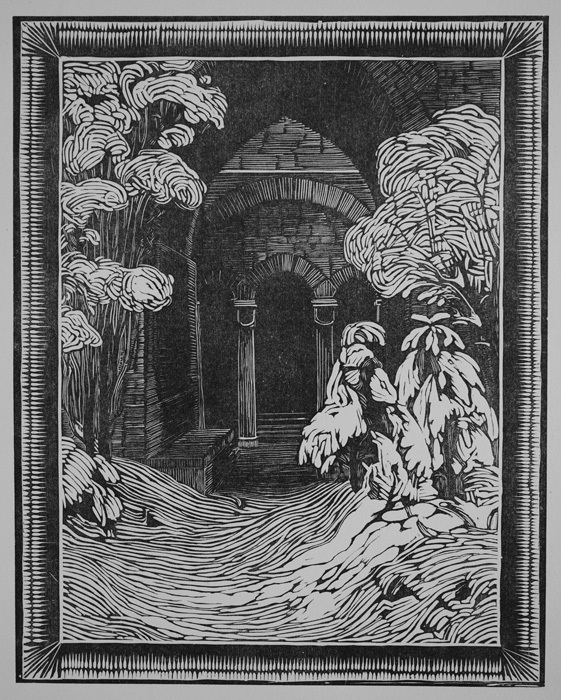 Original woodcut on heavy wove paper c. 1898 as published in Pan V: 4. Behrens was one of the founders of the German Jugendstil movement and the creators of several of its most important artworks. Although this landscape has not achieved the staus of The Kiss (seee above), it is stil regarded as an important work for its use of the flowing curves of the woodcut. Image size: 272x215mm. Price: $900.